Many people pick up running to slim down, but let me tell you – once you get into racing, the thing that slims down the fastest is your wallet. When you do 10+ races a year, some as expensive as $100 and most at least $65, the dollars add up quickly. But while I’ve come to justify race fees as the price to pay for a fun, endorphin-rich experience and year-round motivation to stay healthy and active, one thing I cannot come to terms with is the cost of race photos. 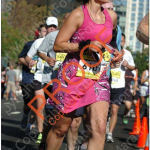 Now, to be brutally honest, typically I have next to no desire to purchase my race photos anyway, seeing how ridiculous I look in most. I’m too sweaty. I look fat. Weird shadows make my legs look hairy. Or fat. (Or both!) I’m making a sour face. I’m making an Edward-wants-to-eat-Bella face. I’m grinning like a maniac and look like Ziggy Marley’s illegitimate daughter (seriously, I have proof). My nose is too big… well, not that I can blame the photographers for that, could I? In fact, the one and only person I know who manages to look amazing in all her race photos, without fail, is my friend, runner and curry lover Colleen DeBaise. She looks so fabulous, always, that New York Road Runners once used her photo as the cover for one of the races we ran together. True story. 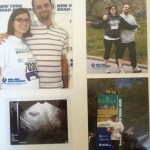 I’ve been lobbying her to spill all her fabulous race photo secrets here, as guest blogger. Fingers crossed! But to get to the point: earlier today I received the link with my San Jose Rock’n’Roll Half photos and a few of them are only half bad. 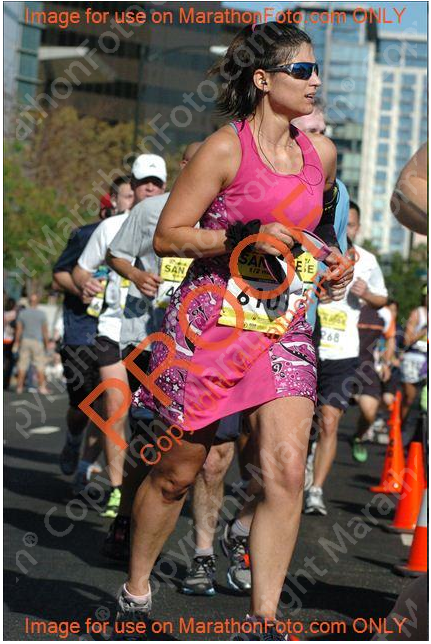 I particularly like the awkward pose-in-front-of-finishers-wall one, where I specifically remember being told: Come over here to take a race photo for free. Free, huh? Well, I guess the “taking” was free. The having, $64.95 (before tax). That, for the pleasure of downloading all my photos as digital images. Want to download one image only? That’d be $34.95. Now, at this point most people just take a screenshot of the photos they like, but because race photography outlets are no fools these days, they have copyright watermarks plastered all over the place. So, you get something like the image to your left. Way to make me feel guilty, big orange diagonal letters! Of course, you could also always screengrab the thumbnail previews, as long as you don’t mind ending up with something like this. Oh, hello there, tiny one. Yet, they did send a bunch of photographers to the event, who spent many hours sitting in what I can only imagine are not very comfortable positions so they can take pictures of all participants. Then someone had to spend who knows how many hours going through every single photo and tagging it with the runner’s race number, so that each of us could find their photos in their database easily. That is no small effort and is truly appreciated. But come on. The emailing of digital photos costs you nothing. Why must you charge me $65, which coincidentally is also how much I paid to run the race itself? I am willing to bet that not many people will pay the steep price as is now, but if they lowered it to, say, $15 for the set, they’d get hundreds, if not thousands of orders. Not least, it must be noted that the official race photos are by no means a runner’s only option when it comes to memorializing those events. Friends, family and fans can be asked to snap pictures as they cheer you along the course. 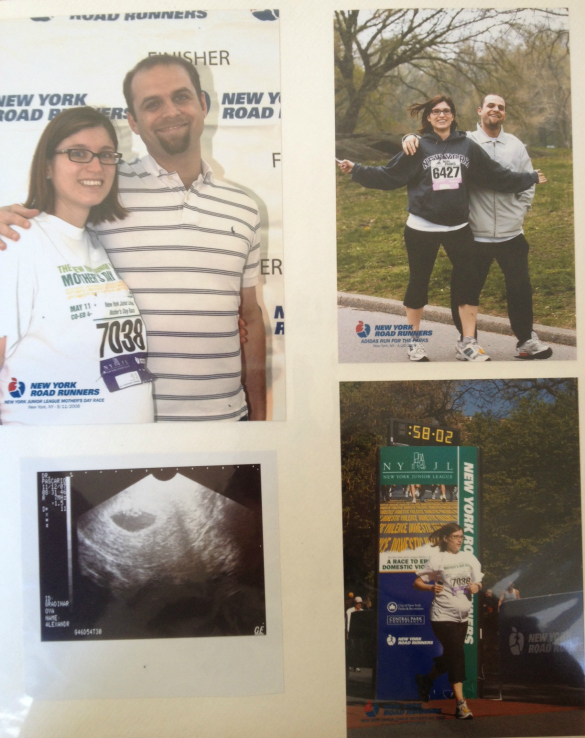 And many smaller races have volunteers snap photos, which they share with runners for free. Brazen Racing, which organizes trail races throughout the East and South Bay Areas here, posts all race photos, high resolution, on Picasa. Sure, you have to click through hundreds of photos to find yourself (they are not tagged), but you can’t beat free now, can you? I’ve just found your blog, I really like it and I’m a little hesitant to say this so soon in our ‘blog friendship’ but I think you’re wrong. I agree with everything you say. Race photos are obscenely expensive and I think the photographers are greedy, if they made them cheaper they would surely sell SO many more. But I still think it’s wrong to post their pics on your website. It’s like saying Prada handbags are ridiculously expensive so you’re going to take one anyway. I think there’s a grey area – you could post their pics by linking to the site or quoting them as a source. But we can’t just take things we think are too expensive, be they race photos or Prada handbags. Totally agree about not justifying the price, it IS ridiculous. BTW those photos of you are brilliant, I would have bought one! !